Sizzling Style is what distinguishes a spellbinding book from an ordinary one. The writer who understands the fundamentals of fictional writing style knows how to capture readers and never let them go. Too often aspiring writers are frustrated by rejection, not realizing that the problem is not the story but the way they are telling it. In this book, bestselling author William Bernhardt brings his down-to-earth approach to the subject of style, revealing everything you need to know to write with the art and craft of a seasoned professional. Bernhardt goes beyond memorizing rules to a fresh approach, a philosophy of writing that will transform your work and take it to a higher level. Because as William Goldman famously said, "No one really knows what will be commercial, but everyone knows good writing from bad writing." The book also includes exercises designed to help writers apply this approach to their own writing. Dynamic dialogue can turn an otherwise ordinary novel into a delightful read, but dull, uninspired dialogue will cause readers to lose interest and try something else. In this book, bestselling author William Bernhardt, renowned for his handling of dialogue, explains his techniques for making characters come to life through their words. He explains the importance of matching character and dialogue, of avoiding dialogue that's "on-the-nose," and the value of using dialogue to suggest what no one will say aloud. Bernhardt explains how to enrich your story and quicken the pace with dramatic and clever dialogue exchanges, skillful use of dialogue beats, and subtext. The book also includes exercises designed to help writers apply these ideas to their own writing. "Writing is structure," William Goldman said, but too often aspiring writers plunge into their work without grasping this fundamental principle. Story structure is one of the most important concepts for a writer to understand—and ironically, one of the least frequently taught. In this book, New York Times-bestselling author William Bernhardt explains the elements that make stories work, using examples spanning from Gilgamesh to The Hunger Games. In each chapter, he introduces essential concepts in a direct and easily comprehended manner. Most importantly, Bernhardt demonstrates how you can apply these ideas to improve your own writing. All fiction is character-driven, according to William Bernhardt, despite what you might have heard elsewhere. If your characters don't interest readers, even the most exciting plots will fail. "Action is character," Aristotle wrote, but what does that mean, and how can you use that fundamental principle to create dynamic fiction that will captivate readers? This book explains the relationship between character and plot, and how the perfect melding of the two produces a mesmerizing story. Using examples spanning from The Odyssey to The Da Vinci Code, Bernhardt discusses the art of character creation in a direct and easily comprehended manner. The book also includes exercises designed to help writers apply these ideas to their own writing. Even the most unique and interesting characters will not engage readers if their journey—the plot—fails. In this book, bestselling author William Bernhardt reveals the secrets that will keep readers riveted to the page. He explains the importance of matching character to plot and the key distinction between surprise and coincidence. 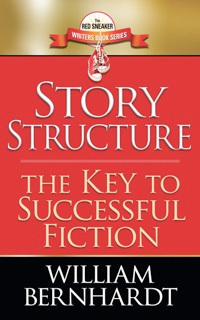 Bernhardt discusses how to enrich your story by layering three levels of conflict and, in the final chapter, analyzes the primary plot structures that have delighted readers since the first story was told. The book also includes exercises designed to help writers apply these ideas to their own writing.